$39 - $50 Flower Bouquets We pride ourselves on our elegant floral presentation at FlowerFresh and take great pride in our fresh flower bouquets and arrangements. Whatever type of flower bouquets you order, may it be a pink rose flower bouquet or a pastel tulip flower bouquet, you can be guaranteed that your flower arrangement will look stunning and fresh on arrival. If you are not sure which flower bouquet to go with, gerbera daisy flower bouquets are a lovely vibrant colored happy bouquet. 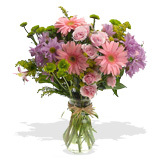 Fresh Flower Bouquet Care Tips: Your fresh flower bouquet will be thirsty and tired upon arrival. To revive your flower bouquet, re-cut the bottom of the stems at an angle by 1-2 inches under running water. After re-cutting your fresh flowers, remove the foliage that will fall below the water level, this will maximize the vase life of your fresh flower bouquet, as leaves in water will promote bacterial microbial growth that may limit water uptake by the flower. It is important that you keep you fresh flower bouquet in a cool place, away from direct sunlight, heat and drafts.